Today, a group of approximately 200 displaced persons entered the territory of Mexico from the city of Tecún Umán, Guatemala, through the La Canastilla pass on the Suchiate River. 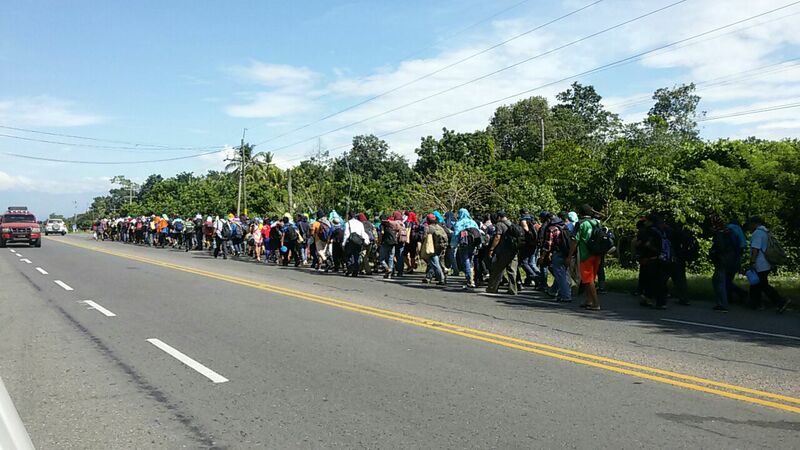 The group was able to advance as a caravan, walking from Hidalgo city towards Tapachula, but it was intercepted by security forces at the junction of Highway 200, on the crossing to Metapa. 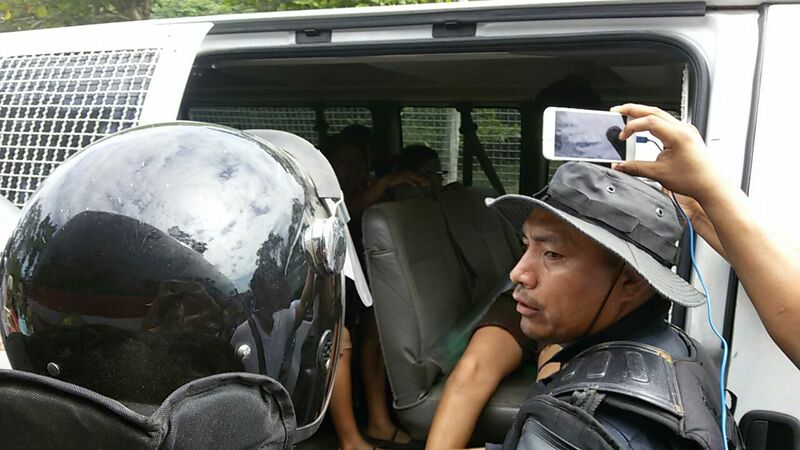 The control operation was made up of riot police from the Federal Police (10 vans), the National Migration Institute (INM, two vans), and municipal police of Suchiate (one van). The Civil Protection was also identified. 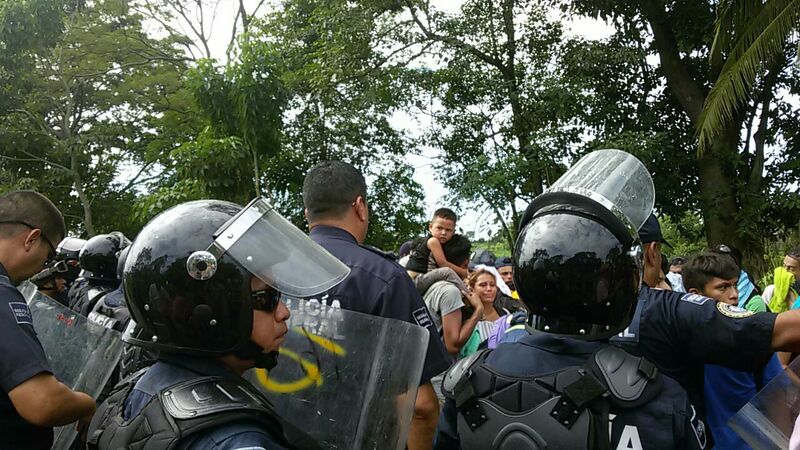 Between 10:30 and 11:30 in the morning, the Federal Police and INM operation surrounded the caravan through a strategy that encircled it to a point in which people had no possibility of escape. 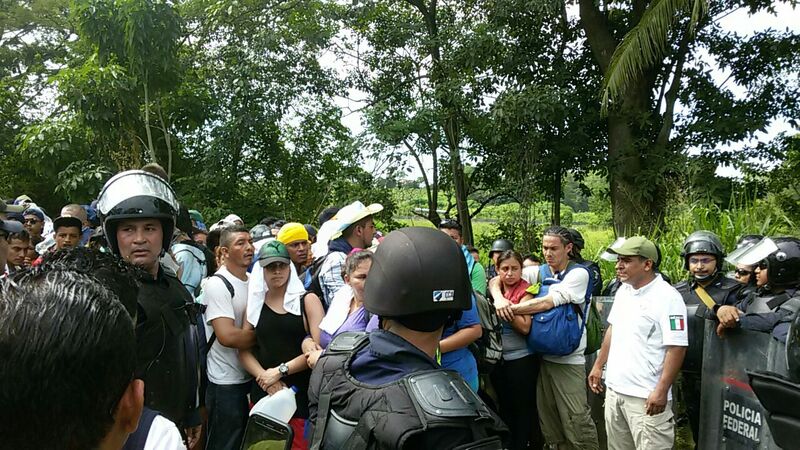 The operation tried to prevent observer groups from seeing the caravan, and gave verbal instructions to the media to move away. Various agents issued shouts, threats, and messages to misinform people on immigration and asylum procedures. 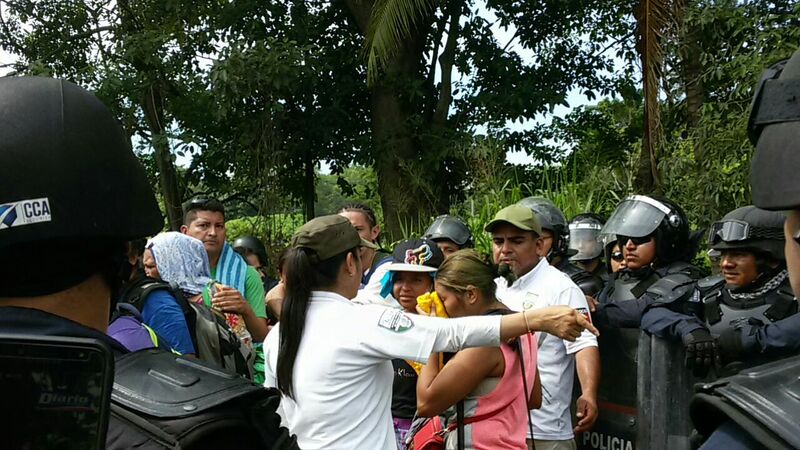 The Consulate of Mexico in Tecún Umán, who appeared in the operation, gave interviews declaring that the operation was carried out according to the law, and shouted things to people in the caravan such as “Don’t believe those who bring the deceived” or “According to the law, you can’t be without documentation." The people in the caravan organized with men and young people to move forward in a human chain to resist, and behind them women and children, some of whom agreed to surrender. The members of the caravan had information about the asylum procedure and they demanded humanitarian visas which would allow them to cross Mexico. The Federal Police and the INM told them that "the arrest and transfer to the Migration Station is part of the process to obtain safe passage." The strategy of misinformation used, and the deception on part of the security forces, making people believe that they came to protect and offer regularization to people, worked, and the group was mostly handed over to authorities. Another strategy has been to separate families. 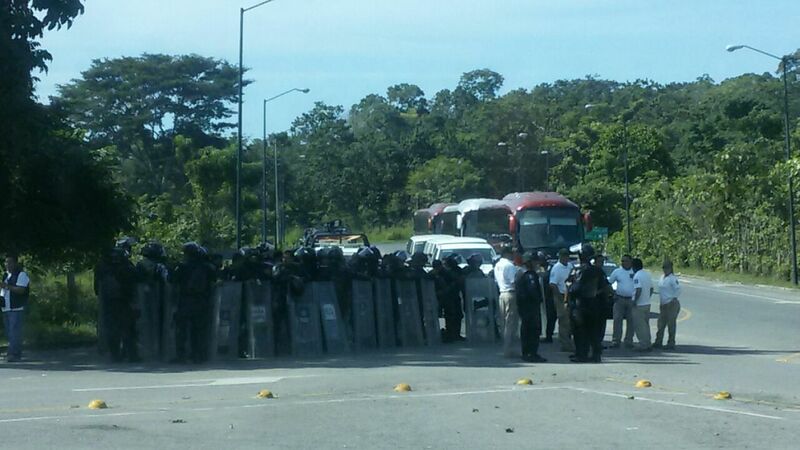 There was a moment of tension between the Federal Police and the INM, because the Federales tried to reinforce the physical containment and the detention of the displaced persons, while the INM agents intended to take charge of the detentions by themselves. Among the people who resisted arrest, about 50 people, was a pregnant woman who fainted. Seven minutes later, while her classmates stood aside to give her space, the police loaded her and took her to an INM van without medical attention. The truck left while the woman was still lying unconscious. The INM refused to inform us of the location to which she was transferred, although we know that she finally arrived at the immigration detention center in Tapachula. A group of the National Human Rights Commission arrived at 11:20 a.m. They did not make any kind of intervention in the field, maintaining an observation role in a discrete place. 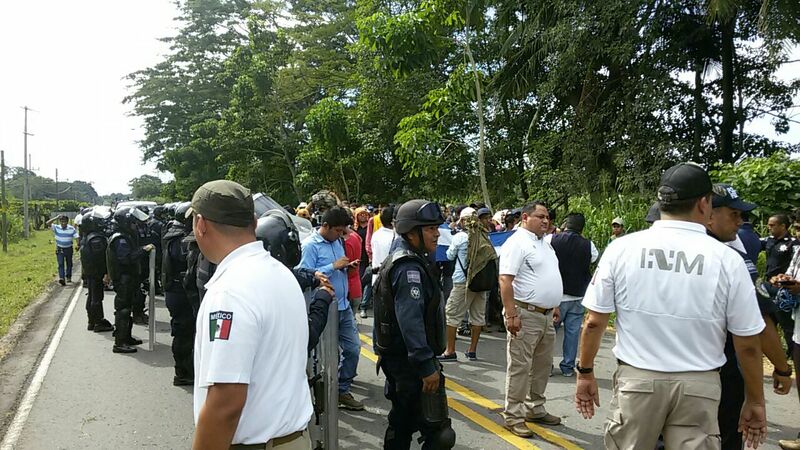 As a result of the operation, the entire group of people who made up this caravan have been detained and admitted to the immigration detention center in Tapachula. From the Observation and Monitoring Group of Human Rights in Chiapas, we denounce that the Mexican State remains in an position of submission to the United States government, assuming the role of controlling what the US considers its external border, which becomes the violation of the fundamental rights of displaced people who, in these exoduses, are arriving in Mexican territory in search of international protection. We urge the Federal Government of Mexico to redirect its migratory management and border control policies, prioritizing respect for the international law of human rights, especially regarding the protection of refugees, the principle of non-refoulement, and facilitation of migratory traffic through national territory.